Recent takes on the zombie subgenre have seen the films' protagonists empowered with various weapons and firearms, leading to a slight suspension of disbelief as ordinary people seemingly have natural marksmanship. 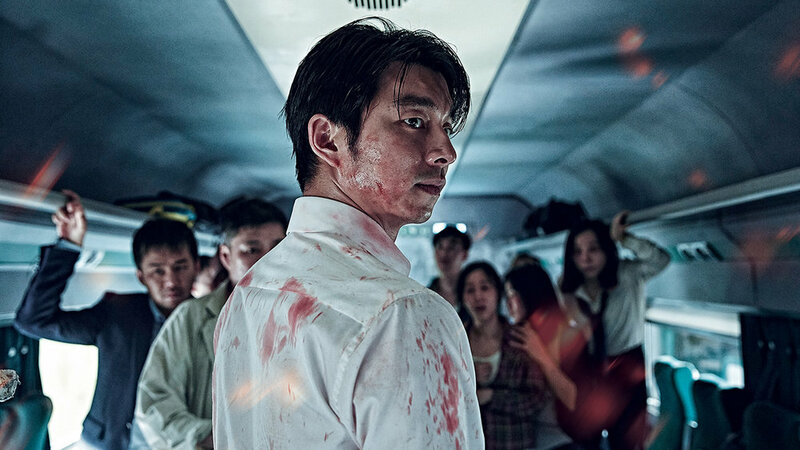 However in this film from Sang-ho Yeon, firearms are heavily restricted in South Korea, so our ensemble of characters are left rather helpless on a train filled with the undead. Welcome aboard on the Train to Busan. The premise is rather simple; Seok-woo (Gong Yoo), a divorced fund manager, decides to take his young daughter Su-an (Kim Su-an) to her mother in Busan for her birthday. They board the train from Seoul to Busan. However, a clearly unwell young woman stumbles onto the train just before it departs. Within minutes, the panic and infection spreads rapidly amongst the passengers. Soon, the whole train is populated with the newly undead, leaving the protagonists and everyone else in a desperate struggle for survival on the speeding train. Train to Busan quickly introduces us to an ensemble of supporting characters, including a rugged man with his pregnant wife, two lovers, a selfish businessman, two elderly sisters and a homeless man, among others. The movie gives enough of an introduction to these characters to make you care about them, while not stifling the lightning pace of the movie. Train to Busan also has an underlying social commentary harkening back to Romero's Dawn of the Dead (1978). Romero focused on criticising consumerism. Train to Busan critiques Korean Culture with subtext of class conflict and government hypocrisy, mirroring incidents such as the recent Korean ferry incident. This critique is quite blatant but not too shoehorned or preachy, and serves to distinguish the film from just being a pure zombie film with high octane action. Without spoiling too much, the movie's undead are of the fast archetype with a few twists. They can't smell, and rely on sight and hearing. The transition from infected to undead takes only a few seconds. Whereas most zombie movies would have the survivors shoot their way out of a hard place, the survivors of the KTX train are left mostly weaponless. This lends the film a degree of realism and immersion. It also makes the zombies truly terrifying and feels like a genuine threat to the characters. This limitation leads to some creative and unforgettable action set-pieces, which are the highlights of the film. The first set piece where the infection spreads on-board sets the bar for the action. When one stewardess is bitten, it doesn't take long before multiple passengers are bitten and turn into zombies within seconds. The decision to run comes too late for many. We witness a crescendo, as passengers starts to scramble to the other carriages, all while the growing undead population scurries closer carriage by carriage, in an increasingly claustrophobic interior. It is absolutely terrifying and jaw dropping once you realize this is just the beginning of what's to come. Another highlight set-piece involves an unsure stop at a train station which is reportedly quarantined by the military. Tension arises as the station seems to be abandoned, leading up to the inevitable reveal that the military is also infected. This sequence trumps the previous one, with the survivors in separate groups racing back to the zombie-filled train. While one group is attempting to re-board the train without releasing the infected locked in the carriage, another group is trying to lock a set of glass doors to make sure they have enough time to escape. If I had to draw criticisms of the film, there are some sparse moments where the undead appear a bit cartoonish as the horde pile on top one another, however the spasmodic movement of the zombies is convincing otherwise. Some contrived dialogue occurs between Seok-woo and Su-an during the film's calmer moments. There are also minor pacing issues towards the end, which I can forgive, given the movie’s well-paced structure that keeps the audience on their seat. Overall these are minor faults in what might be one of the best zombie films of this century. Stunning adrenaline pumping sequences are balanced with some emotionally devastating scenes. Train to Busan is one hell of a train ride, and one that you should not miss.